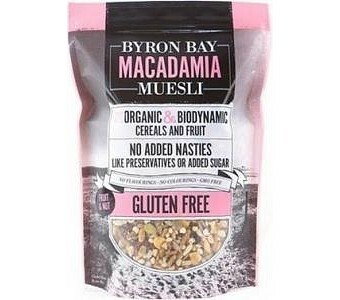 Perfect for those who are on a gluten free diet, Byron Bay Macadamia Muesli Gluten Free will soon become your favourite breakfast companion. A delicious semi-honey roasted medley of organic nuts, fruit and cereals, for added nutritious value top it off with some fresh blueberries to enjoy the natural sweetness of Byron Bay Gluten Free Muesli. Gluten Free No cholesterol Low in saturated fat and sodium No added preservatives No added sugar Ingredients: Organic sunflower kernels, pumpkin seeds, sesame seeds, insecticide free almonds, organic sultanas, organic Raisins, rice bran shreds, biodynamic apple & pear, organic apricots, puffed white rice, organic puffed brown rice, organic puffed millet, organic puffed amaranth, spray free macadamia nuts, macadamia honey & cold pressed macadamia oil, almond meal, prune juice.